Sachin Patel owns Five Points Bottle Shop in Athens, GA.
After returning from a beer expedition to the UK, Owen Ogletree (director of Brewtopia Events LLC) and Don Beistle gathered fellow beer lovers Eric Johnson (co-owner of Trappeze), Thel Melton and Sachin Patel on November 12, 2008 at Trappeze in Athens, GA to sample and comment on several excellent bottled English Ales brought home in their suitcases. This sampling was done as a "best of show" blind tasting where no one was aware of the brands that were being served. Products were informally commented upon and ranked according to Beer Judge Certification Program (BJCP) style guidelines. First, second, third place, and honorable mentions were awarded to the products we felt represented this style in extraordinary fashion. Drop Owen an email to share your comments and opinions. We must mention that due to each of these beers being delicious and well-made, it was extremely difficult to choose standouts (thus our multiple ties listed below). L-R: Eric Johnson is co-owner of Trappeze in Athens. Don Beistle writes the "Ask Dr. Brewski" column for Southern Brew News. Aroma: Hint of currants, toffee, caramel, spicy hops. Light aromas; slight fruit; citrus; earthy; raisin undertones. Appearance: Dark amber / light brown; clear; light foam. Flavor: Malty; biscuity; cereal-like; toasty; caramel notes; finishes dry; malt is balanced by hops; pleasant; cookie-dough hints; complex fruit undertones (figs, berries). A rich, complex, satisfying ale. Aroma: Mild aromas of fruity esters and a hint of biscuits. Appearance: Amber color; clear; nice head. Flavor: Bready; honey; slight caramel; mild bitterness; creamy; soft; elegant sweet malt notes; well balanced. Aroma: Hoppy note; esters; green apple hint; earthy late hop additions apparent. Appearance: Amber color; clear; medium/light foam; brilliant; good head retention. Flavor: Malt; biscuits; toast; tart cherry hints; creamy; hops are light in flavor; big bitterness for an English ale; hops are well balanced by malt; very pleasant. 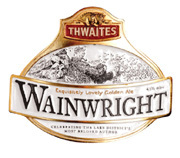 Aroma: Fruity; slight butter; hop notes; peach hint; light esters and malt; biscuit hint. Appearance: Amber color; clear; light head. Very attractive. Flavor: Malt; creamy; fruity; balanced toward malt and esters; hops are in background; crystal malt is nice; vanilla notes; a hint of dark malt character comes through. Aroma: Malty; fruity; caramel/toffee hint; mandarin orange hint; slight note of lemon zest. Appearance: Amber color; clear; medium/light head retention. Flavor: Bready; biscuit; malt tones; toast hint; toffee notes; balanced toward malt; berry notes; candied fruit undertones; fig hint; very subtle malt complexity; chalky hint; extremely pleasant. Aroma: Biscuit malt; mild citrusy hops; floral note; earthy; malty. Appearance: Dark gold; very clear; brilliant. Flavor: Clean; crisp; nice hop finish; very sessionable; nice bitterness; floral; slight citrus hop flavor; slightly sweet finish. Very drinkable and pleasing. Aroma: Butterscotch; pine resin hint; tropical fruit esters; spice hints. Appearance: Amber color; clear; light head; big bubbles. Flavor: Woody; tannin-like; grassy; leather; hint of roasted grains; peaty; dry finish. Aroma: Hint of dark caramel malts; slight blackberry esters; slight floral hop note. Appearance: Amber color; clear; medium/light foam. Flavor: Malty; dry; woody hops; clean; well attenuated; bready; medium toast flavors. Aroma: Fruity; melon hint; smoke hint; leather note; hops; spicy undertones. Appearance: Slight haze; amber color; light foam; low head. Flavor: Very complex; grassy; smoke hint; herbal; melon; woody; almost no carbonation; dry, but not too bitter; rye-like; peaty; woody tannins; earthy, grain husk notes.